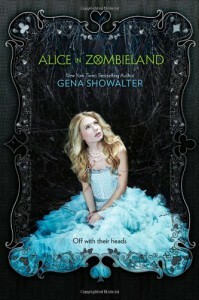 Though not particularly memorable, Alice in Zombieland is a fun read, a quick romp through the staples of the genre: teen angst, teen love affairs, dealing with family (or the lack thereof), good girls, bad boys, and fighting a little evil on the side. ...well, I liked her take on zombies right up until the scene where they're caught in the spotlight: "...their skin was like chipped ice, glistening with onyx and sapphire undertones." (pg 317) I actually laughed out loud and couldn't help but think someone's been taking ill-advised lessons from another YA fantasy novelist. First sparkly vampires, and now zombies glistening like precious gems? Oh my mercy! The romantic scenes (at least I'm assuming the kissing and groping and fantasies were supposed to be romantic) were ridiculous and laughable. On the other hand, certain interactions between characters were spot on, most notably the "I'm your best friend for life...unless you're dating or hanging out with them, in which case you're beneath me and I won't be your friend anymore" dynamic of a girls' high school clique. It seems ridiculous now, but as I read I remembered those days with a shudder. Overall, Alice in Zombieland was good. Certainly not "blow your mind" great, although the book gets extra points for having a great cover. Would it be my first recommendation if someone asked for suggestions within this genre? Nope. Would I encourage someone to read it if they showed any interest? Yep. Definitely worth reading while kicking back in bed with a snack. And yes, I'll be reading the sequel when it comes out later this year. Because it's certainly enjoyable enough to develop a bit of loyalty towards.